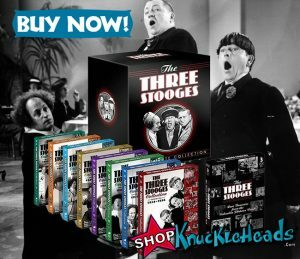 The Three Stooges An Ache in Every Stake - trivia, video clips, photos. 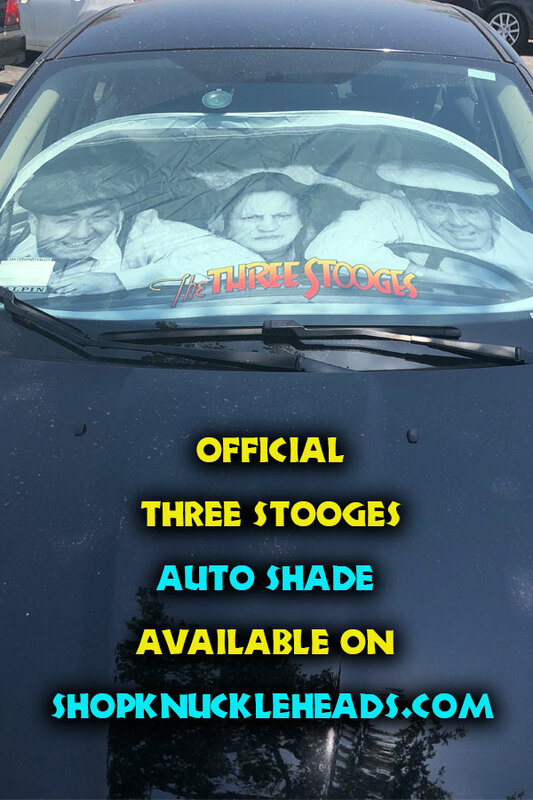 In An Ache in Every Stake, a quintessential fan favorite, The Three Stooges are icemen that have fallen asleep in their delivery wagon. Their horse wakes them up. Curly finds his face and head embedded in a large block of ice after having used it as a pillow. 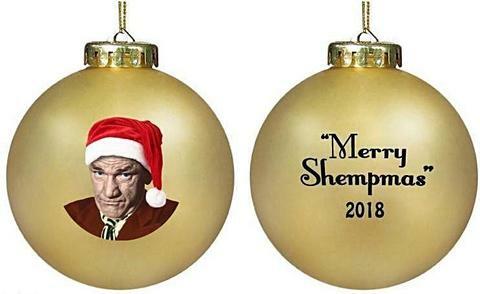 Moe and Larry break him out of it, and they begin their ice block deliveries. After several deliveries, they are called to make a delivery at a house atop a long, high staircase. It’s so high that every time they go up, the ice melts to a cube. They make several attempts including relaying it successfully to the top, only to have Curly drop it. It’s during these attempts and arguments that they bump into Mr. Lawrence (Vernon Dent) and ruin his cakes. When The Stooges antics cause the servants at their customer’s (Bess Flowers) house to quit, they volunteer to replace them and prepare dinner for her husband’s birthday party. Unknown to them, her husband is Mr. Lawrence, whose cakes they had wrecked earlier in the day. While working in the kitchen, Larry tells Curly to shave some ice – which Curly does by placing a block of ice on a chair, slathering the bottom of the block with shaving cream, and using a straight razor to shave off the cream. Moe interrupts Curly and tells him to go back to stuffing the turkey, which Curly does by incorrectly following the stuffing directions. When dinner is served, one of the guests finds a ring and a wristwatch in her stuffing, believing it to be prizes. But the ring & watch turn out to belong to Curly, who lost them off his hand while stuffing the turkey. When the birthday cake they prepare is finished, it is accidentally pierced, and it deflates. The boys “re-inflate” the cake using town gas through the gas stove’s connection. 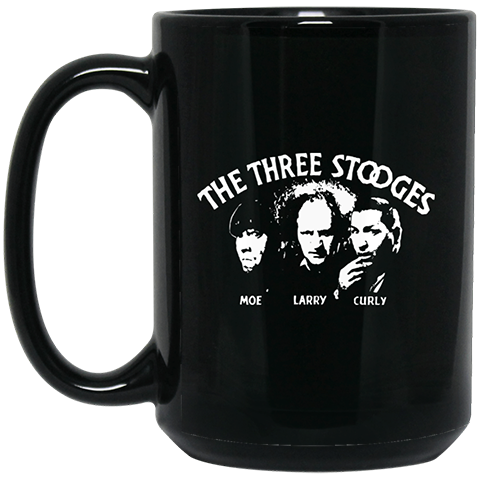 During the party, The Stooges sing a “Happy Birthday” song to the tune of “London Bridge is Falling Down”; when Mr. Lawrence blows out the candles, the gas-filled cake explodes. 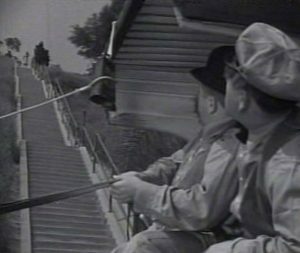 Mr. Lawrence angrily realizes who the new ‘help’ is, and The Boys are forced to leave in a hurry, riding a flat board down the stairs, and tumbling off near the bottom. Partially redone as Listen Judge (1952). The turkey stuffing gags were performed 7 years earlier by Shemp Howard in his Vitaphone short subject A Peach of A Pair (1934); the director of that film was Lloyd French, An Ache in Every Stake‘s screenwriter. The famous Stooges Steps (147 steps in length) used in the melting ice sequence are located at 2257 North Fair Oak View Terrace in Glen Flex/Silverlake area of Los Angeles, California. The stairs are still there on the cul-de-sac. The other outdoor locations were filmed at Columbia Ranch. The former Columbia Ranch is located at 411 N. Hollywood Way in Burbank, California and is now called the Warner Bros. Ranch. Two sequences, carrying the ice up the stairs and the turkey preparation, put this film into classic status, but neither is more extraordinary than Curly shaving the ice. Film historians have praised Fred Astaire for making even inanimate partners seem to dance gracefully, so Curly should receive similar credit here for metamorphosing an inanimate block of ice into a ‘being’ capable of having a shave and a conversation. Usually, Curly gets frustrated with an inanimate object, but here he is in total control. Filming was completed March 26-29, 1941. The plot device of carrying ice up a flight of stairs derives from the Billy Bevan silent film Ice Cold Cocos (1926), also directed by Del Lord. According to the SilentEra website, Ice Cold Cocosused the same staircase as Hats Off and The Music Box. This is one of several Stooge shorts in which a sofa spring becomes attached to someone’s backside. This gag was also used in Hoi Polloi, Three Little Sew and Sews, Hugs and Mugs and Have Rocket, Will Travel. The film marked the final appearance of supporting actress Bess Flowers with the Stooges.